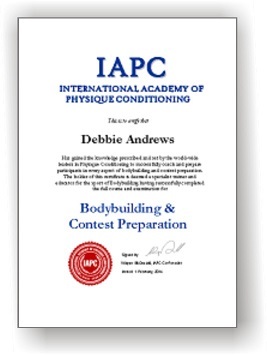 "Who Else Wants To Learn The Secret to Building A Great Physique..."
For more information on the IAPC Bodybuilding Certification Course, and to buy...click here. 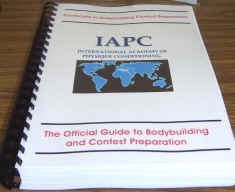 As well as the Bodybuilding Certification Course, the IAPC also has the 2300 page Nutritional Food Composition Table Suite CD for Windows (AUD$297 Value). With it you can quickly, easily and accurately design simple diets right up to the most advanced specialty eating plans in existence…the type that can give you and your clients a winning edge. You can quickly find high protein foods, low carbohydrate foods, low fat foods, low calorie foods…foods high in potassium or zinc or sodium. Foods low in cholesterol…in fact whatever it is you need to know…you’ll find the answer here. Over 2000 pages…all with an accurate quick fast search function. 83 comprehensive tables in all…with a database of 6040 foods will enable you to select nutrient compositions for all of them. Not only can you use search function…you can browse the tables which are both alphabetically listed and sorted from highest to lowest. Use these tables to manipulate fluid balance, reduce bodyfat or increase protein intake for muscle growth. The composition tables of 6,040 foods puts the power of the worlds most advanced reference library in your hands. Nothing is as comprehensive. But even more importantly…nothing is easier to use…inbuilt search function allows you to find exactly what you need…fast…no more wading through piles of irrelevant junk…pinpoint what you need and go straight to it! Imagine the benefits and control you have putting any diet together - working off such an extensive resource giving you the protein, fat and carbohydrate content (and more) of 6040 foods! The research used to prepare these tables cost the U.S. Government $12,000 per food item, totalling $72 Million! But you’ve now got the chance to utilise this invaluable information to make your business and results fly. You can't buy this information at a book store...and if you could, 83 tables complete with search engine would cost an arm and a leg. So whether it’s 2 in the morning or 10 at night…don’t waste another minute waiting for tomorrow…DO IT NOW! 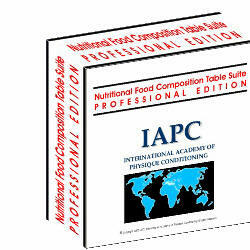 The IAPC Nutritional Food Composition Table Suite Pro edition CD for Windows is valued at USD$297. "An up-to-date manual on sports injuries should be an essential requirement in every Personal Trainers library." Question: "Who Else Wants To Learn The Secret to Building A Great Physique..."
A: Knowledge...and you'll find it in the IAPC range of products listed above.